How Do You Know When You Need A New Laptop? How Often Should You Buy A New Laptop? How Much Is A New Laptop? What you’re looking for is a balance of performance and price – a laptop that is capable of handling any tasks you throw at it, but without needing you to remortgage your home, or sell a kidney. But how can you possibly decide which one is best for you? After all, if you’re going to drop a few hundred bucks/euros/pounds on a computer, it would be nice to know that you won’t want to throw it against a wall within hours of buying it. And worse again is every manufacturer says their laptop is the absolute best thing since slice bread, or Star Wars. So, settle down, grab a beverage, and let’s figure out together exactly what you should be looking for in a new laptop. It come down to how patient you are, and what you need to do with your computer. The reason why I’m including this here is to save you spending money you might not need to. You might think you want a shiny new laptop that costs nearly a grand…but you might not actually need one. Most people decide to upgrade to a new laptop once the one starts running slowly. If your laptop is running really slowly have you tried reinstalling Windows? Or failing that have you looked into upgrading the RAM or hard drive? You’d be amazed at how much of a difference a RAM and hard drive upgrade can make to an older model. But if you’ve exhausted all the upgrade options, a Windows reinstall makes things worse, and you’ve even tried Linux, but the laptop is still running at a snail’s pace…then that’s when to get a new laptop. This kinda ties in with the question above on when you should buy a newer computer. Marketing departments work very hard to convince you to buy a new laptop every year. But do you really need to do that? Well, ask yourself if you need to buy a new car every year? Of course you don’t, but if marketing departments had their way you’d buy a new car every six months. The truth is that a well specced laptop should last several years. The only real exception to this is if you’re gamer, and if you are then you’ll find some way to justify spending $3k on a portable gaming system no matter what I say. For the average Joe or Josephine Public, you should only need to buy a newer (not even brand new) laptop every 2 – 3 years. You’re going to hear the same advice here that I give friends when they ask me about buying a new computer: What do you need it for? That’s the first and most important question for you to answer. Not answering this question pretty much guarantees you’ll buy a laptop that not only cost too much, but also doesn’t do what you want it to. So, this advice is a double-edged sword i.e. 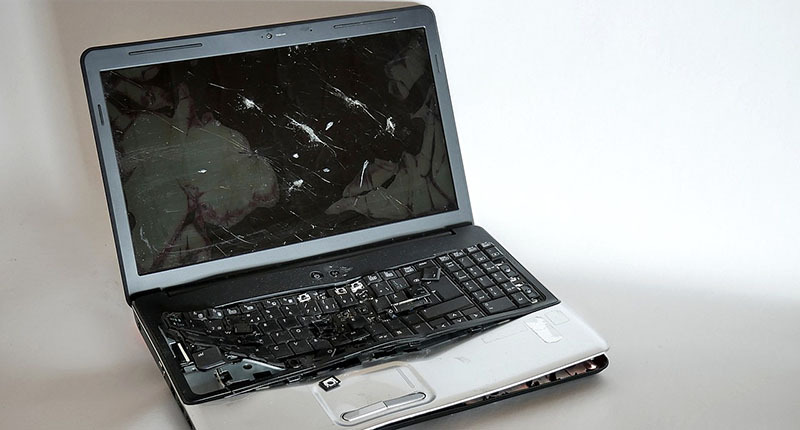 don’t buy a personal laptop and try to use it for video editing, and vice versa. There’s no “perfect” processor for you to choose, but a faster processor will always give higher levels of performance…if you need it. Also bear in mind that casual laptop users won’t need a model with an i7 processor, no matter what the salesperson says. These are tiny chips inside your laptop where the processor temporarily stores information. It’s measured in Gigabytes (GB). More RAM is always, always better when you’re working with huge files (Photoshop, video editing), but for the average user buying a laptop with a ton of RAM makes no sense. Your new laptop should have at least 4GB of RAM, but ideally 8GB. The average user won’t need a laptop with any more than 8GB of RAM. Here’s somewhere that you can make a mistake you have lots of time to regret – buying a laptop with a tiny screen. Laptops with smaller screens are way cheaper and weigh less…but a few hours squinting at a 10-inch screen will teach you some very valuable lessons. The absolute bare minimum screen size you should accept is 12-inches, but ideally 15-inches. Laptops with huge screens weigh a ton, the battery life is terrible (big screens eat a lot of power), and are generally a bad idea unless you’re a graphic designer. So, a laptop with a 14 or 15-inch screen will suit 99% of people. The hard drive is where all your files are stored, so obviously you want to have as much of that storage space as you can afford. But can you have too much? Well it all depends on what you’ll use your laptop for (see that advice keeps popping up around here). If you plan on storing a lot of video files, or high resolution photographs, then a 1TB (1 terabyte = 1,000GB) hard drive makes sense. If you’ll only ever use your computer for college projects, web browsing, and streaming Netflix box sets, then a 500GB is more than enough for you. You’d probably get away with a 250GB drive to be honest. What about SSD (Solid State Drive) options? SSDs are amazingly fast, but they’re also more expensive than regular laptop hard drives. So, while a regular 1TB hard drive would cost about $50, the equivalent SSD costs at least $250. If at all possible never, ever buy a laptop without either testing the keyboard, or reading enough reviews on it so you know the keyboard is a pleasure to use. There is no worse experience than trying to type on a laptop keyboard that’s uncomfortable, or just badly designed. I have an old laptop here that’s absolutely impossible to type on accidentally bump the touchpad, so the cursor shoots across the screen. I’ve never been more frustrated in my life than trying to type on it…so I keep it around as a reminder. Yes, you can always plug in an external keyboard, but that kinda ruins the portability of your new computer, right? There is nothing more frustrating than buying a laptop that looks great on the surface, but has a battery life of 90 minutes (*cough* Macbooks…). One of my final deciding factors when purchasing any laptop is how long the battery lasts. If you’re going to only ever use your laptop at home then this isn’t an issue. But if your business requires you to be out and about on a regular basis, then battery life is a big issue. In an ideal world your new laptop would have a battery life of around 8 hours, but 4 hours is the bare minimum I can tolerate. This is one of those “How far is up?” questions, because you can spend $90 on a basic refurbished laptop, or $5,000 on a gaming system. It’s about controlling your spending urges. The reality is that most of you won’t need to spend any more than $700 on a new laptop, almost regardless of what you need it for – and that includes using it to play games on…when you swore that would never happen. There was a time when shopping online meant you could save yourself a lot of cash. While that’s still true, it’s always worth checking local computer stores to see what ex-demo or refurbished laptops they have for sale. There’s a computer repair store near me that cleans up old laptops, and sells them on for between $1 50 and $200. They’re not top-of-the-range models but they’re more than adequate for basic use. If you don’t have anything like that available in your area then check out local computer stores for end-of-line models, ex demo models, or anything except the shiny new laptops on display. Because the performance difference between an ex-demo laptop and a brand new one is zero. The difference in performance between last year’s model and this year’s model is about 5%. Do you really want to pay an extra $200 – $500 for a barely noticeable increase in performance? Now let’s look at buying a new laptop online. My first tip is to look for refurbished laptops before you do anything else. You’ll find lots of online retailer selling them. These are usually ex-government laptops, or were barely used in corporate settings. At worst they’ll have maybe a tiny scuff mark or two on them. An additional benefit is that they’ve never been abused and have been professionally maintained by an IT team while they were in use. Want me to recommend a specific model? No problem – look for a Lenovo T420 or T430. The T420s are loved by journalists the world over because they’re rugged and comfortable to use. Apparently they’re also constructed to military standards, so they’re at least good enough for home use based on that. 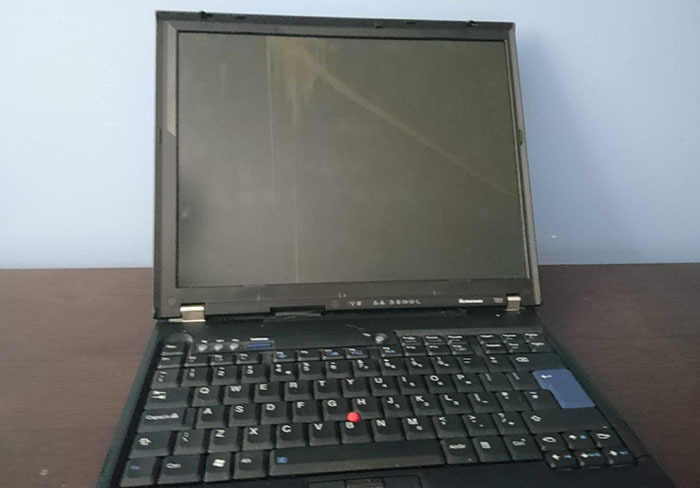 Actually here’s a picture of an old Lenovo T61 (the grandaddy of the T4xx series) I used up to quite recently. Yes, I managed to crack the screen…keep forgetting to replace it. It’s also the reason why I had to upgrade to a newer system. If you really, really have to buy a brand new laptop then stick to brand names you recognize. These include Dell, Asus, Lenovo, Acer, HP and Microsoft. Microsoft are the most expensive of the bunch. They make stunning laptops, but you’ll need to take out a loan to buy one. Don’t buy a gaming laptop and then try to justify that it’s really for work. You’re going to spend at least $500 more than you need to (more like $1,000) and you’ll find that the battery life is awful, even if the performance is amazing. They also tend to weigh as much as a small child, so carrying them around is as much fun as sticking a pencil into your eye. What’s the difference between a Windows laptop and a Chromebook? It’s simple really – a Chromebook runs on Chrome OS, which is fine but you won’t be able to install any Windows applications on it. You also have to rely on cloud storage because their internal hard drives are usually in the 32GB (tiny) range. This might not seem a big deal at first, especially because Chromebooks are so reasonably priced, but you could find it severely limiting after a few weeks or months. You can buy a brand spanking new Chromebook for around $170. Just understand that it’s not a true laptop – it’s more like a large smartphone with a 14-inch screen attached. A true Windows laptop (or Linux if that’s your thing) will usually cost $50 – $100 more than a standard Chromebook, so you might wind up saving money but regretting it. Hopefully you feel a bit more enlightened now about exactly what you should be looking for in a new (or refurbished) laptop. I’ve done my best to include everything I can think of here, but if you have any questions or suggestions, drop them into a comment below. Should I Downgrade From My Smartphone?